That leaves me with a LOT of stories to tell you about, and Iowa, Minnesota, Nebraska, New Mexico, North Carolina, and South Carolina left to visit. Technically, I’ve had an in-depth visit of the Albuquerque airport en route to Seattle courtesy of a torrential downpour out of Texas. In my six hours there, I managed to purchase a souvenir magnet and postcard for my collection, and drained the battery of my phone twice. However, I’m not going to count that as actually “seeing” New Mexico. I really only saw various New Mexico residents departing or arriving while tethered to my charger. As it turns out, I’m not alone in my quest! 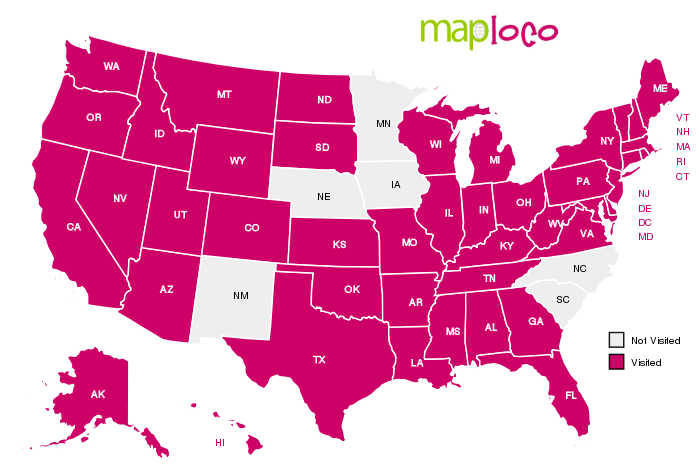 A cursory Google search turns up all sorts of articles on the subject: How to Travel 50 States with Kids; What Counts as Visiting all 50 States? ; Visiting 50 States is Harder than you Think. My favorite is the 50 States Club certificate you can earn on the honor system for a mere $12 plus shipping. Maybe I’ll treat myself to one of those someday. While I may not be completing my fifty state quest anytime soon, I’m gearing up for the Road Warrior lifestyle again this fall, and look forward to taking y’all (okay, I went full Texan there) along for the ride!